Alpaca wool is a rare specialty fiber that is versatile enough to be used in anything from chunky sweater knits to streamlined suiting. It is known for its’ lustrous, soft, durable and flexible nature. More and more design houses are using this natural fibre in their collections to convey a sense of luxury and creativity. There are two major types of alpaca: Huacaya grow soft crimped, sheep-like wool ideal for knits and Suri grow straight, silky, lustrous wool better used for high-end wovens. Alpacas are native to South America, making us uniquely positioned to take advantage of the largest and most experienced alpaca wool production industry in the world. We are able to source the wool in a wide variety of weights, textures and blends (both natural and synthetic) to complement any design. 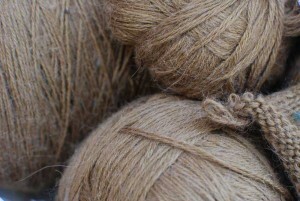 An added benefit to the flexible and durable alpaca is that it is a renewable, sustainable fiber that is naturally organic. An alpaca’s fleece is sheared once per year using largely hand production techniques. Alpaca ranching has reasonably low environmental impact and the animals themselves are gentle to the Earth. In fact, when the Spaniards came to Bolivia in 1530 only then did soil erosion start occurring as a result of the livestock they brought with them. The native animals of alpaca, llama and vicu?a all have soft hooves, allowing soil to stay in place and having a minimal impact on the land. The domesticated animals the Spaniards brought over on the other hand: cows, sheep and goats, all have hard hooves that easily break up soil and cause erosion. Not to worry, we can walk you through the process of using this luxury wool and can provide you with suggestions and methods that would best suit your designs. With over 15 years of experience, we are very familiar with traditional uses of alpaca and are always striving to invent new textures, colors and uses. This year, we are venturing into hand-spinning our own yarn in order to create creative textures and boutique yarns.